Dreaming of a home remodel or renovation? If a sleek and stunning kitchen or stylish new living room has fallen low on your list of priorities, these beautiful Boston home projects might just be the boost you need to make a change. Whether you’re looking for an updated ceiling fixture or hoping to completely gut your old bathroom, here are eight photos of projects hand-selected by Chris Rapczynski, the president of Sleeping Dog Properties, Inc. to inspire your space. The pad also integrates media, shade control, and lighting control, reflecting the high-class amenities in Boston’s third tallest skyscraper. This 7,500 square-foot farmhouse is a cozy country getaway in Amherst, New Hampshire. 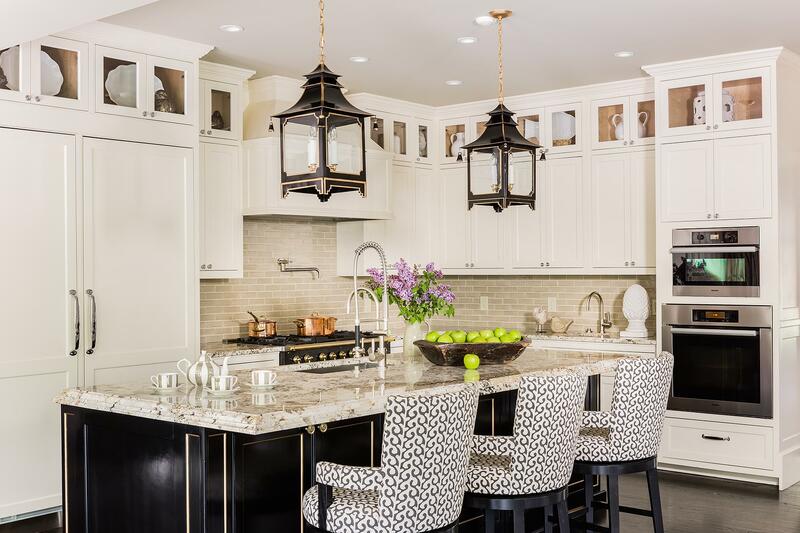 Working with Tony Cappoli Interiors, the team coordinated reveal, molding, and panel lines with the layout of the space and custom wooden cabinetry. The granite island was finished with fine locomotive engine black and gold bead paints. 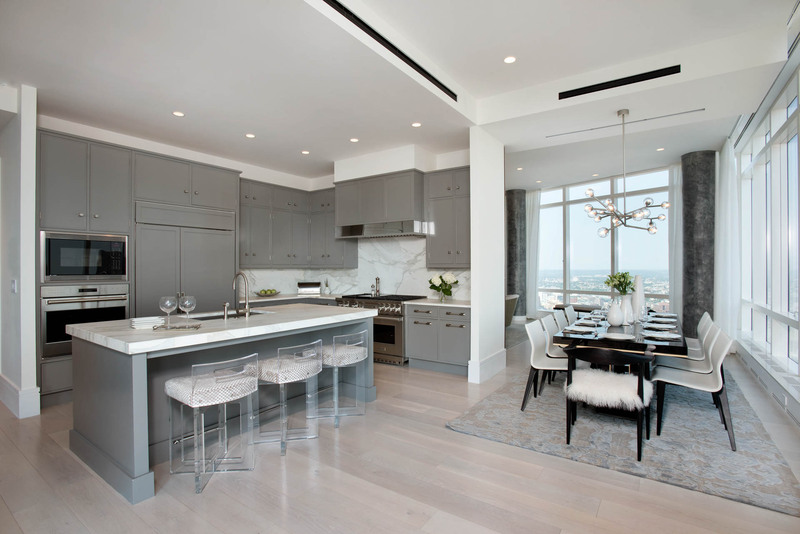 For another remodeling project in Millennium Tower, this glamorous penthouse offers the ultimate rest and relaxation retreat. The marble floor and tile complement the modern ceiling fixture for a gorgeous grey layout. 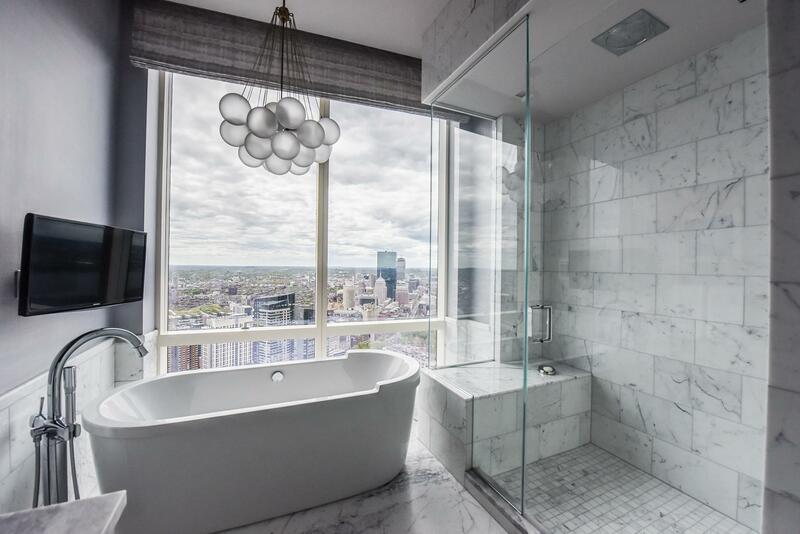 The bathroom includes a beautiful bathtub and all-glass shower with incredible views of the Boston skyline. The ceiling includes a high-gloss, white-buff finish, and the room is outfitted with wood paneling and crown molding around the perimeter of the room. A custom ventless fireplace consists of three different sections of material – the gray section on the bottom is tile, the band of black in the middle is absolute black stone, and black and white custom stone sits atop. To top it off, a TV pops out of the right-hand side of the fireplace for the perfect movie night setup. 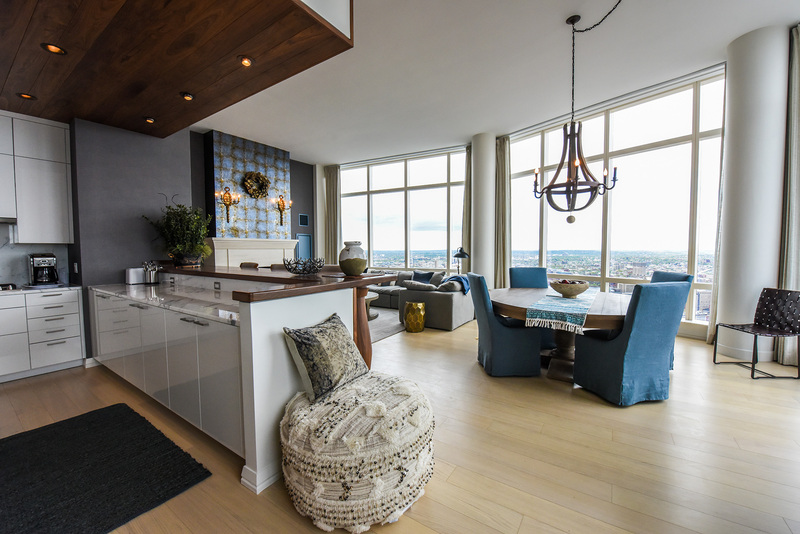 Situated near the top of the Millennium Tower, this 4,500 square-foot penthouse has jaw-dropping panoramic views of the city. 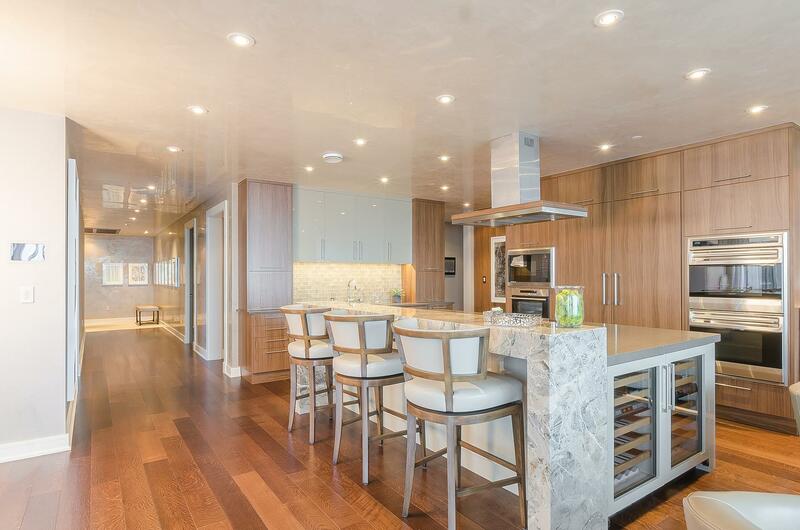 The custom kitchen boasts an all-glass wine room with wireless media integration and home automation throughout the unit. Implementing earth and ocean-toned textures, wallpaper, and furniture, the space reflects the surrounding views of the Boston Harbor. 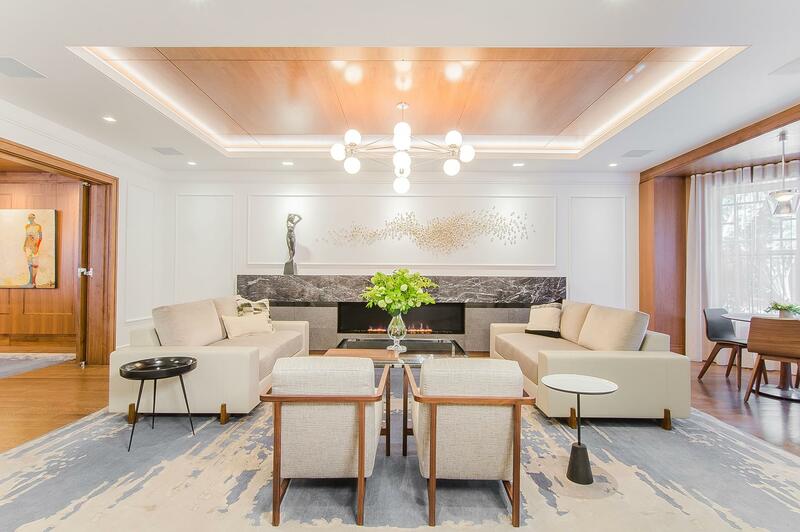 The recently renovated 4,000 square-foot private residence at the InterContinental showcases walnut veneer cabinetry, Caesarstone countertops, two wine coolers, high-end appliances, and more. The kitchen island has an induction cooktop with a high-gloss finish and marble features, while the cabinetry was designed to hide all appliances (including trash pull-outs and a full-height freezer and refrigerator) with outlets installed inside cabinets to conceal wires. A coffee maker and toaster are housed in the upper cabinets above the sink, and two larger cabinets on either side of the sink are clever disguises for dishwashers. Part of the penthouse remodel at Millennium Tower, this custom his-and-hers closet is an organizational dream come true. With a glass display case lining the top shelves, double racks for hanging clothes, and a seemingly never-ending assortment of drawers, every accessory can find a home. The gorgeous and abstract ceiling fixture tops off the design. 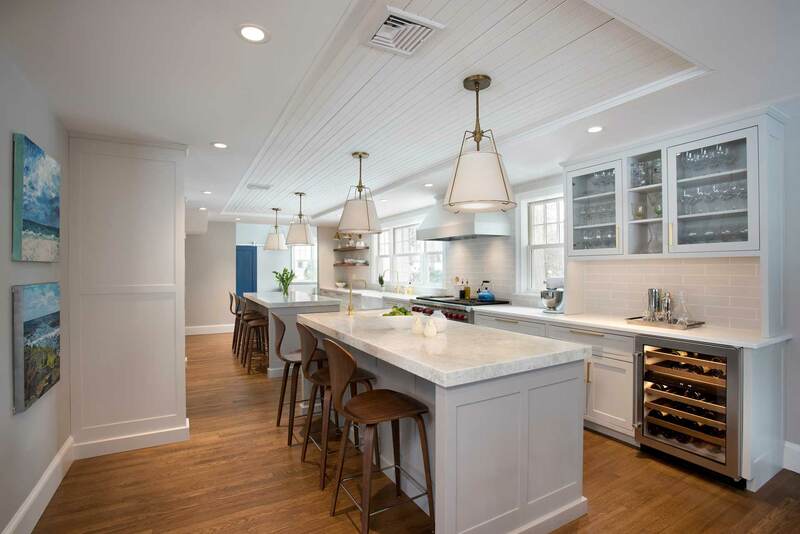 This Wellesley home renovation included a complete reworking of the first-floor and basement layouts, custom millwork, upgraded heating and cooling systems, and a complete exterior makeover with new siding, roof, and entry. The team created an open and bright space that allowed the family to gather comfortably together, but still find solace in unique cozy alcoves. Two islands helps keep the movement and flow of the space, without interruption of one large piece. For more information on how Sleeping Dog Properties, Inc. can deliver the home project of your dreams, visit sleepingdogproperties.com.